The UPA2 government finds itself in a jam with its flagship Mahatma Gandhi National Rural Employment Guarantee Scheme (MGNREGS) being widely misused even as the National Human Rights Commission (NHRC) decided to conduct its own independent audit of the scheme along with two other flagship programmes of National Rural Health Mission (NRHM) and Integrated Child Development Scheme (ICDS). New Rural Development Minister Jairam Ramesh has, however, taken up the challenge on how to synchronise the employment guarantee programme with the ground realities and prevent leakages at the implementation level in districts. 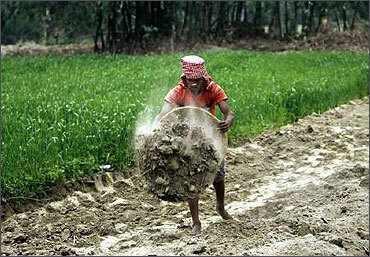 Image: A labourer works under NREGA to build a dirt road at Sheikhpur in Bihar. The NHRC is conducting a review of these programmes to report to the UN Human Rights Commission in 2012. "It is important to do an audit of what impact the flagship schemes have had on the well-being of the poor as there is growing evidence of diversion of funds meant for these schemes," an NHRC official said. 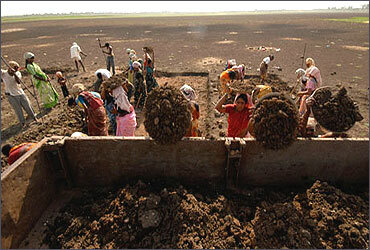 The MGNREGS guarantees 100 days of work to anybody in the rural areas willing to do manual labour. But the average number of days of employment under the scheme has been 47 and hence the NHRC wants to explore if funds are being misused or if the commitment made by the government in the Act is being denied to the villagers. Image: Labourers load a truck as they try to revive a dried lake under the NREGA at Ibrahimpatnam, Hyderabad. Influential farmers are exploiting the employment guarantee scheme to send off farm labour to draw wages from the government whenever not required on the fields. In the same manner the textile industry kept 30 per cent surplus staff to get their mills running and paid them through the Employees' State Insurance (ESI) scheme. On top of it, they are now putting pressure on the government to suspend the MGNREGS during peak farming periods of sowing and harvesting to ensure they do not have to pay high wages to the farm labours. The labourers in rural areas prefer to work under the scheme that pays them more and that too without putting in the hard 12-hours plus labour on the fields. The government cannot issue any order officially to shut down works under the scheme as the law binds it not to deny employment to anybody turning up for work. However, the Rural Development Ministry has "informally" asked the states to suspend these works during sowing, harvesting and transplantation. 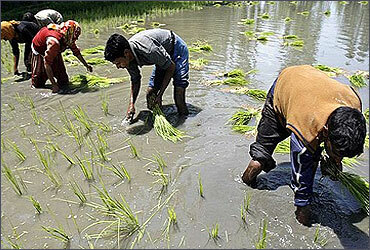 Image: Labourers sowing rice saplings. The state governments too are exploiting the scheme to pressurise the ministry repeatedly to match the wages under the scheme with the minimum wages statutorily notified in their states. 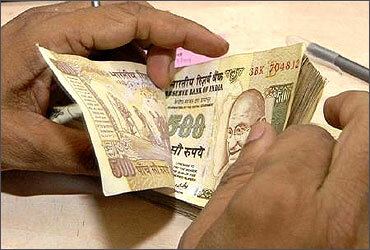 They first revise the minimum wages and then seek revision of the wages under the scheme. Only last week, Punjab Chief Minister Parkash Singh Badal demanded that the daily wage rate under the scheme be raised to Rs 200 as the present wage -- Rs 133 per day -- fixed for Punjab under the scheme does not match the minimum wage fixed by his government at Rs 153.81 without meals. Ramesh had a tough time to explain that the scheme is not to provide minimum wage but its a guarantee of wage to persons not getting any employment or wage otherwise. He is already examining the problem handed down to him by his predecessors who raised the wage under the scheme above the minimum wage in many states. 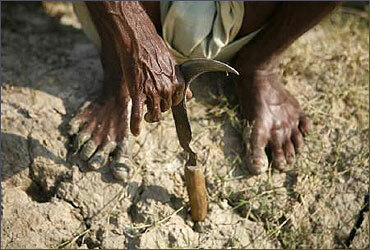 Such pressure tactics have led to non-availability of labour for agricultural works. Image: A cashier counts notes. For instance, Punjab's neighbour Haryana has fixed the minimum agriculture wage at Rs 167 per day while it has compelled the Centre to fix the MGNREGS wage at Rs 179 per day. There are many states where the farm labour is not easily available because of the wages under the scheme being higher than the minimum wage rates. The MGNREGS wage rate in some such states, with the minimum wages in brackets: Uttar Pradesh Rs 120 (Rs 100), Madhya Pradesh Rs 122 (Rs 110), Orissa Rs 125 (Rs 90), Bihar Rs 120 (Rs 109), West Bengal Rs 130 (Rs 96), Assam Rs 130 (Rs 87) and Tamil Nadu Rs 119 (Rs 85). There are, however, other states where the scheme wage is lower than the minimum wage, leading to human rights organisations (NGOs) accusing the government of perpetuating forced labour in clear violation of its own laws on the minimum wages. Image: A farmer sitting in a paddy field in Nandigram village. The Centre had, in fact, tried to freeze the scheme wage at Rs 100 per day across the country through a notification in January 2009 but it had to withdraw it under protest from the states and NGOs that it was unjust as the wages varied from state to state and there can not be a uniform wage all over India. The People's Action for Employment Guarantee (PAEG) went to the extent of accusing the Centre for use of Section 6(1) to delink MGNREGS wages from the Minimum Wage Act as "not just bad in law but also immoral in so far as it seeks to lower the real wages of the lowest end of workers in the wage hierarchy." 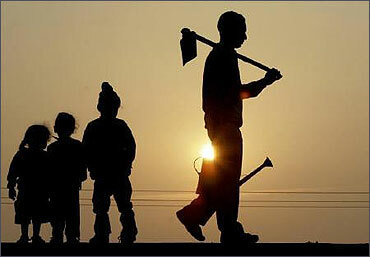 Image: A labourer carrying his tools is silhouetted against the setting sun in Chandigarh. India Inc training next gen for top job!